With a little more than one week until the beginning of the 21st Annual International Mars Society Convention, scheduled for August 23-26, 2018, there is still time to register online for this major space conference to be held at the Pasadena Convention Center. 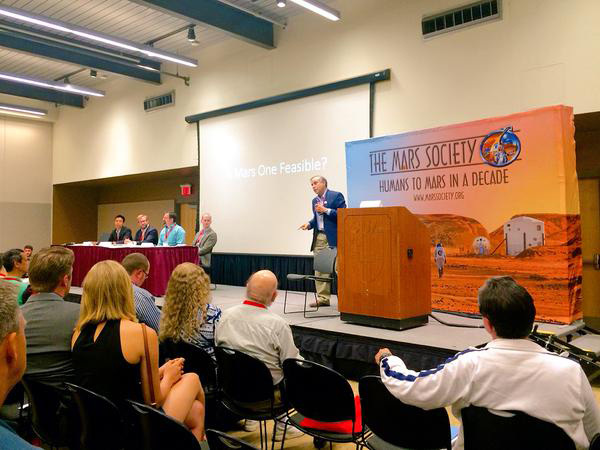 The four-day International Mars Society Convention will include a series of plenary talks, panel discussions and public debates on issues of great importance to the humans-to-Mars effort, as well as other space-related news. Areas of discussion will include the future of U.S. Mars exploration, an update on the Mars InSight mission, the past, present and future of Mars rover missions, the use of VR for exploring Mars, NASA’s continuing search for exo-planets, SpaceX plans for the Red Planet and a full review of the Mars Society’s Mars Desert Research Station and the most recent University Rover Challenge. In addition, a panel discussion about the soon-to-be-released Hulu series, The First, involving a Sean Penn-led crew of astronauts attempting to become the first humans on Mars will be held at the Mars Society convention on Sunday, August 26th. Stay tuned for more details. To view the full program itinerary, please click here. Tickets for one-day attendance are also available online and on site the day of the convention. Contact us (info@marssociety.org) with any event-related questions.